The Searsport Planning Board listens to the second day of testimony in this week's public hearings on the proposed liquid propane gas terminal and project on Tuesday, Nov. 27, 2012. 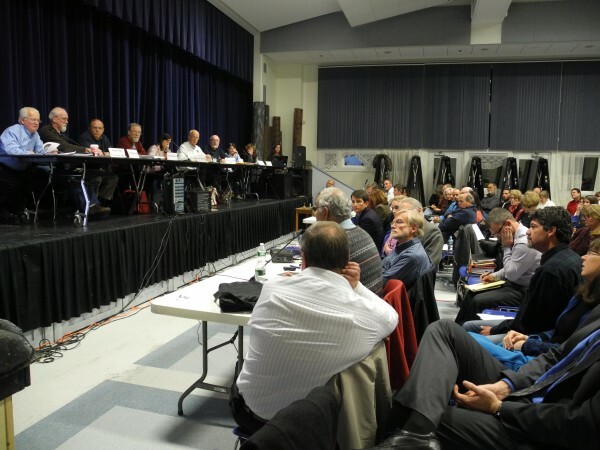 SEARSPORT, Maine — As a crowd of about 200 people listened — sometimes adding audible boos and derisive laughter — officials from DCP Midstream on Tuesday night talked a lot about the company’s proposed $40 million, 23-million-gallon liquid propane tank. It was the second of four public hearings about the liquid propane tank and terminal project to be held this week in the Searsport District High School cafeteria by the town planning board. Different company experts presented in detail information about the project’s visual impact, safety considerations and the reason why Denver-based DCP Midstream wants to locate it in Searsport. They were trying to assuage some of the concerns that have spread widely around the midcoast region over the nearly two years that the project has been in the planning stages. If the Searsport planning board accepts the company’s application, the tank and terminal will be built in the Mack Point industrial zone, which already is home to other, smaller tanks. At the end of the two-hour presentation by Baldridge and other company officials, planning board members and those granted “interested party status” took about an hour and a half to question those same people. The board gave that status distinction Monday night to several individuals and groups that hope to persuade members that the project should be denied. Dr. Phani K. Raj, an industry expert, served as a safety assessment consultant for DCP Midstream. He dismissed concerns that include the scenario of a boiling liquid expanding vapor explosion, or BLEVE, in the 14-story high propane storage tank. He said any liquid fuel that spills from the storage tank would be conveyed into a dike, and showed a short video of a liquid propane gas burning in a controlled setting with him standing in street clothes nearby. Jeff Hurteau of DCP Midstream said that in the event of a power failure, the fuel vapors would be routed to an exterior flare. Ordinarily, the tanks would be maintained at 45 degrees below zero. “It’s our desire to not operate that flare any more than we absolutely have to,” he said. Additionally, the flare burns much cleaner than those built in refineries, he said. Other safety features include gas sensors and flame detectors throughout the facility, an automatic fire suppression system and the ability to shut off the fuel supply. “We feel that this system in itself provides a significant layer of safety and reduce the need for fire assistance from outside,” he said. Company officials also addressed the question of liability. There are at least two names used in connection with the project. But interested parties, including Steve Hinchman, the attorney for opposition group Thanks But No Tank, wanted more reassurance. “So yes or no, will you pay 100 percent of the costs of an accident?” he asked company officials. DCP Midstream attorney Jamie Kilbreth responded that this was the type of question they would like to hear from the planning board. “This is not Mr. Hinchman’s job, frankly,” he said, as the crowd booed. “As an interested party, I have the right to ask questions and receive answers,” Hinchman said. Baldridge said all the company’s affiliates were covered under an insurance policy. The public hearings will continue Wednesday night beginning at 6 p.m. in the Searsport District High School cafeteria.